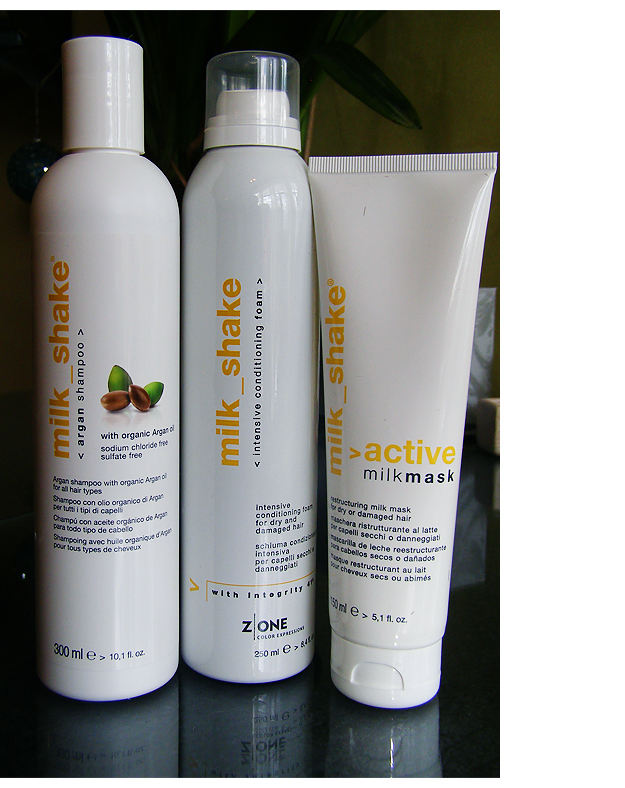 The Milkshake Hair products are from z.one concept, a trend setting professional brand for hair stylists that was formed in 1999 by Ivano Panzeri in Italy. The Milkshake line focuses on natural ingredients such as milk and wheat protein, botanical and fruit extracts and Argon oil. Argon, for instance, used for centuries in Morocco, is a nut oil made from the rare Argon tree found in the desert regions of that part of the world. Known for its beneficial qualities, Argon oil has been an important part of dietary traditions and used as well as for healthy skin and hair care. In addition, Milkshake products are also sulfate and paraben free. In addition to formulating with natural ingredients for healthy hair, z.one concepts has developed these products to address a wide range of professional styling needs for all hair conditions. The shampoo line alone offers eight different products. In addition there are a variety of products under the following headings: conditioners, treatments, styling, curl passion, volume solution, coloring and more. The description for Daily Frequent Shampoo, just one of Milkshake’s many products, is typical. It is described as a mildly protective shampoo for all hair types or for frequent use, specifically studied to gently cleanse natural or slightly dry hair, while maintaining the optimal moisture balance inside the hair and preserving color integrity. This shampoo contains an amphoteric surfactant derived from Shea butter, cleanses the hair gently, leaving it hydrated and soft right after the first application. The fig and currant extracts give the hair lightness and conditioning, without making it heavy, while the milk proteins have a strong integrative and conditioning action on the hair structure inside its cortex. Aloe Vera has a calming and soothing action on scalp and hair and the rich vitamin complex (B3, B5, B6, C, E) has an invigorating action on scalp and hair and leaves it fresh and vital. Ask your stylist for recommendations regarding which Milkshake products might be most suitable to meet your own hair care needs. This entry was posted in Hair Care Tips, Z one and tagged hair styler, Ivano Panzeri, Milkshake product line, Z one on December 2, 2013 by vscentral. Visage Salon Central is a blogsite associated with VisageBarbaraWeen.com. Here, we provide you with the latest news regarding everything Visage Salon. This entry was posted in Amy, Announcements, Barbara, BioIonic, Bumble and bumble, Coloring, Courtney, Cricket, Cutting, Hair Care Tips, Hairpieces and Wigs, Hats and Scarves, Murad, Onesta, Products, Roxanne, Special Ocassions, Special Offers, Styling, Stylists, Surface, X Fusion, Z one on November 21, 2013 by vscentral.